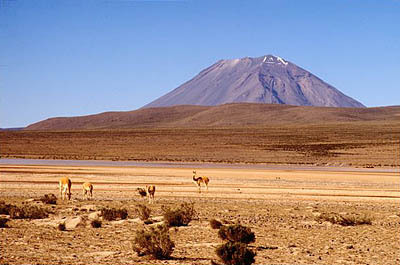 Misti Volcano and vicuñas, Pampa Cañahuas, Arequipa. Photo: Mylene d'Auriol Stoessel. 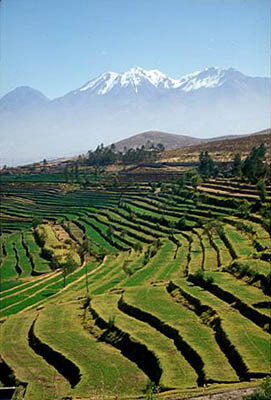 Luxury Arequipa - Colca Canyon Tours & Travel. "Not only did we see the huge condors soaring past on their 9-foot wingspans, but two young birds decided to land about 10 meters from us and proceeded to perch and preen for our cameras." Patio of the Casa del Moral, Arequipa. Morning flight to Arequipa for an excursion of its colonial monuments and fascinating countryside. On the next day, your private, overland expedition sets out under the inspiring Misti Volcano in southern Peru. While passing through a remote terrain of volcanoes and vicuñas, you note immense stone terraces of a culture dating back two millennia and pueblos all but forgotten since Spanish days. At last, you reach the rim of the Colca Canyon. At last, you reach the rim of one of the world's deepest canyons, the Colca, on whose sheer cliff face live the magnificent Andean Condors. 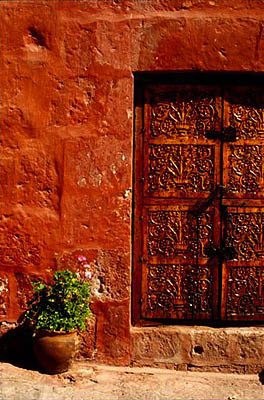 Colonial door of the Convento de Santa Catalina, Arequipa. Day 1: Lima - Arequipa. Transfer to the airport. Flight to Arequipa. Arrival, reception and transfer to your hotel. In the Campiña are fascinating districts, like Paucarpata and Sabandia, that you will see as you travel along the Via Paisajista. Visit the Molino de Sabandia, Mansion del Fundador, Balneario de Tingo, Mirador de Sachaca, Puente Fierro and the Museo Santuarios Andinos. Lunch at La Trattoria del Monasterio before going up to the Mirador de Carmen Alto and Mirador de Yanahuara. Walking tour of the colonial quarter begins in San Lazaro. Afterward, enter the Convento de Santa Catalina. Continue to the Plaza de Armas and the Cathedral. Perambulate the cloister and end on a high note by climbing the Cupula de San Ignacio of the Iglesia y Claustros de la Compañía de Jesús. Dinner at Chicha. Overnight in the Casa Andina Private Collection Arequipa. Day 2: Arequipa - Pampa Canahuas - Colca Valley - Chivay. Below the snow-covered Chachani Volcano, we cross the Pampa Cañahuas to the Reserva Nacional Salinas y Aguada Blanca, a national reserve for vicuñas, llamas, alpacas and other indigenous species. We learn about the plants, animals and volcanoes of the Pampa de Toccra at the interpretation center. Enjoy a box lunch prepared by Alma before we continue on our way past herds of alpacas and llamas to the highest point of our route. From an altitude of 4,900 meters (over 16,000 feet), we have a panorama of the surrounding volcanoes. After four-and-one-half hours on the road, we arrive in Chivay and can relax in the hot springs of La Calera. Arrival at the hotel. Tonight and every night, the view of the stars is unrivalled, and the combination of stars and the peace of the Colca Canyon is truly magical. Dinner and overnight in Las Casitas del Colca. Note: The altitude is even higher than Cuzco's, and the same advice regarding altitude sickness should be observed. Day 3: Cruz del Condor & Traditional Pueblos. Morning drive to the Cruz del Condor, on the rim of the Colca Canyon, where the Andean condors take advantage of the especially strong winds to soar into the sky. We travel on to Cabanaconde, the Mirador de Tapay, Pinchollo, Maca, Achoma and Yanque as well as the Mirador de Antahuilque and the Mirador de Choquetico. Return to the hotel for lunch and to begin our four-hour drive to Arequipa by way of Patapampa, the Mirador de los Andes, the Chucura Crater and the Pampa de Toccra. Arrival at your hotel. Dinner at Alma. Overnight in the Casa Andina Private Collection Arequipa. Day 4: Arequipa - Your next destination. Morning transfer to the airport for the flight to your next destination. Chachani Volcano as seen from the terraces of Yumina, Arequipa. Early transfer to the airport for the flight to Arequipa. Arrival, reception and transfer to your hotel. On the outskirts of the city, called the Campiña (open country), are fascinating districts, like Paucarpata and Sabandia that preserve their pre-Inca terraces, still in agricultural use. You will see these and other traditional settlements this morning as you travel along the Via Paisajista (scenic route) between Arequipa and Tingo. Visit the 1622 Molino de Sabandia, a working mill, and the Mansion del Fundador, the 1540 home of Arequipa's founder, Don Manuel Garci de Carbajal. On the way back to Arequipa, appreciate the lakeside district of Balneario de Tingo, the view from the Mirador de Sachaca and the Puente Fierro, designed by Gustave Eiffel and built in 1882. Spend the late morning at the Museo Santuarios Andinos, learning about the mummy "Juanita", a Virgin of the Sun who was offered in sacrifice to the "Apus", or mountain spirits, about 500 years ago. She was discovered on the Ampato Glacier during the 1996 expedition of archaeologist Johan Reinhard to the summit of Sara Sara, in search of frozen, sacrificial mummies. 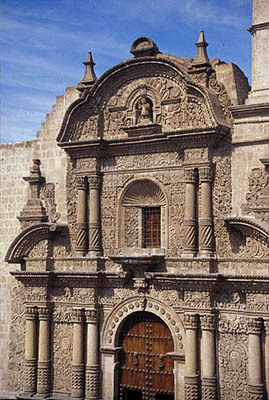 Iglesia de la Compañía de Jesús, Arequipa. A lunch of Italian cuisine by famed Peruvian chef Gastón Acurio at La Trattoria del Monasterio before going up to the Mirador de Carmen Alto, which looks out over the Chilina Valley, and the Mirador de Yanahuara, a splendid lookout over the entire city and the surrounding volcanoes, such as Misti and Cachani. 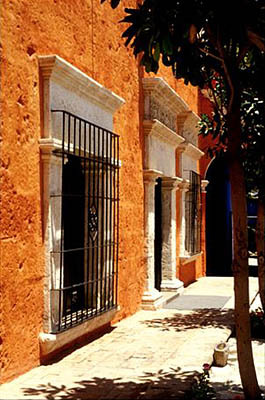 A walking tour of the 16th and 17th-century colonial quarter begins in the district of San Lazaro, the oldest of the city. Afterward, enter the 1579 Convento de Santa Catalina, a place of religious reflection that remained sequestered for almost four-hundred years. Continue to the Plaza de Armas and the Cathedral, constructed in 1621 but frequently destroyed by earthquakes. Perambulate the cloister and end on a high note by climbing the Cupula de San Ignacio of the 1654 Iglesia y Claustros de la Compañía de Jesús. Arequipa's typical construction of white volcanic stone from nearby quarries gives it the name of the Ciudad Blanca ("White City"). As seen in the arcade of this church, the stone's softness allows unusually ornate carving of the blocks, a distinctive characteristic of the region's historic architecture, which you will also observe in the Colca Valley. Dinner of Arequipa's traditional cuisine at Chicha, also directed by chef Gastón Acurio. Overnight in the Casa Andina Private Collection Arequipa. 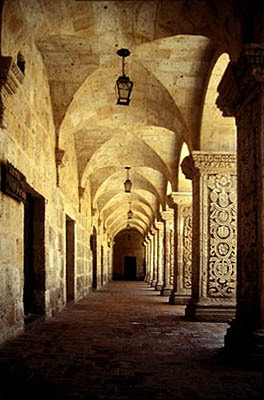 Cloisters of the Compañía de Jesús, Arequipa. 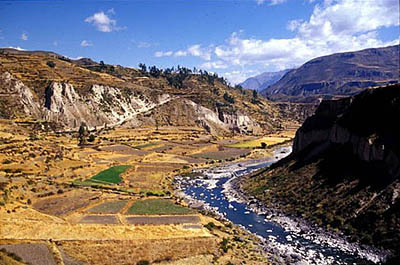 The Colca Valley, to the north of Arequipa, is famed for its geological, ethnographic and cultural wonders. An ethnic group, bearer of ancient and still-strong traditions, has dwelled there for more than 2,000 years. They are the Collaguas, who arrived in the valley from the high regions and seem to be descendents of the Aymaras because of their language and customs. Even under the Inca dominion, they kept themselves relatively independent and preserved their own ways. It is said that the supreme Inca Mayta Capac married a Collagua princess in order to formalize the conquest of the valley and that he built for her an elegant country house made of copper, near Sibayo. 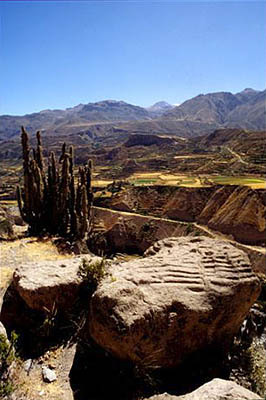 One of the survival skills of the ancient Colca people was the ability to store large amounts of grain for hard times. The storehouses, known as "colcas", gave the the valley its name. In the cool caves of Pumunuta, it is possible to see circular colcas three-feet in diameter, made of mud and starw. There are almost 20 towns along the valley, whose people preserve the ethnic richness of their past more than any other region of the country. The main ones are Chivay, Cabanaconde, Huambo, Maca, Achoma, Yunque, Lari and Coporaque, all very religious towns, whose Catholic faith also keeps alive pre-Columbian elements. Each town has its own church, bearer of its Hispanic inheritance and exemplar of architectural sobriety and purity, based on the white volcanic stone blocks, often richly carved. 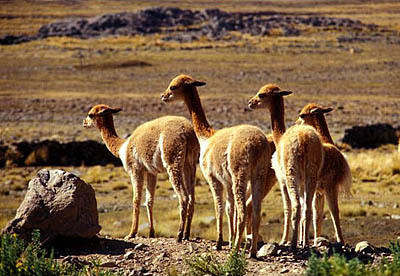 Vicuñas, on the road between Arequipa and the Colca Valley. Breakfast. Our overland expedition passes through a land of volcanoes, pre-Inca terraces, ancient traditions, all-but-forgotten pueblos, vicuñas and condors. Below the snow-covered Chachani Volcano, we cross the Pampa Cañahuas to the Reserva Nacional Salinas y Aguada Blanca, a national reserve for vicuñas, llamas, alpacas and other indigenous species. In Patahuasi, we will drink coca tea to minimize the effects of the high altitude. We learn about the plants, animals and volcanoes of the Pampa de Toccra at the interpretation center. This sanctuary is home to vicuñas, tarucas (North Andean deer), foxes, vizcachas (a rabbit-like creature) and innumerable species of birds. The most curious plant is the yareta, which appears to be a rock covered with beautiful green moss. In reality, it is a highly compact shrub with dense, intertwining branchlets, whose form helps it reduce heat loss and surface evaporation in the harsh cold and arid conditions of the high Andes deserts, known as puna. It grows at a rate of approximately one millimeter per year, and thus many yaretas are over 3,000 years old. Before we continue on our way past herds of alpacas and llamas to the highest point of our route, enjoy a box lunch prepared by resident chef Julio César Valdivia at the Casa Andina Private Collection Arequipa's Alma. From an altitude of 4,900 meters (over 16,000 feet), we have a panorama of the surrounding volcanoes -- among them Chucura, Huallca Huallca, Ampato and Sabancaya. After four-and-one-half hours on the road, we arrive in Chivay, capital of the Colca Valley, and can relax in the hot springs of La Calera, located in a beautiful, open-air setting. Arrival at Las Casitas del Colca, where chef César Landeo celebrates the diversity of Peruvian cuisine with freshly prepared Andean meals, created with herbs and vegetables from the hotel's farm. Tonight and every night, the view of the stars is unrivalled, and the combination of stars and the peace of the Colca Canyon is truly magical. Dinner and overnight in Las Casitas del Colca. Breakfast. Early morning drive, passing mile after mile of pre-Inca stone terraces climbing the hills along the river. The amount of social organization and work required to construct these engineering marvels with primitive tools and without beasts of burden in unfathomable. We ascend above the valley to the rim of the Colca Canyon. Twice as deep as the Grand Canyon, it is the second deepest canyon in the world (the deepest is the Cotahuasi Canyon, just to the northwest). Usually, in such a deep canyon, the rising winds are surprisingly strong. 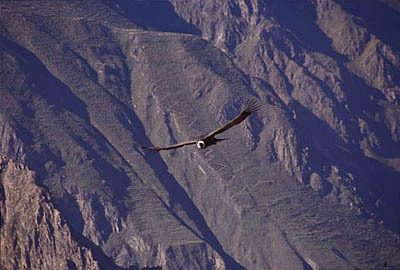 Between Maca and Cabanaconde, the deepest part of the canyon, the Andean condors take advantage of the especially strong winds to soar into the sky. Called the Cruz del Condor, the observation point is perfect for watching their majestic flight above the dizzying abyss, more than 3,000 feet straight down! With luck, we'll see several condors rising above the canyon walls. We travel on to Cabanaconde, a pueblo with different ancestors: the "Cabanas", of Quechua origin, making a stop at the Mirador de Tapay, from where we can appreciate the small pueblos of Tapay, Coshñihua, Malata and San Juan de Chucco, all hemmed in by the canyon's hillsides. On the return to the hotel, visit the the pueblos of Pinchollo, Maca, Achoma and Yanque as well as the Mirador de Antahuilque and the Mirador de Choquetico, with their stone models of the agricultural terraces. Return to the hotel for lunch and to begin our four-hour drive to the city of Arequipa by way of Patapampa. From the Mirador de los Andes, we can observe the Cordillera de Chila (Chila mountain range). Mt. Mismi is foremost, Chucura and Huarancote are further away and Ubinas, Misti, Chachani, Ampato, Sabancaya and Hualca Hualca are in the distance. Crossing the Chucura Crater and passing through the Pampa de Toccra, we almost always come across a variety of Andean birds in the peat bogs. Arrival at your hotel. A dinner of modern Peruvian cuisine by resident chef Julio César Valdivia in the town's most elegant restaurant -- the Casa Andina Private Collection Arequipa's Alma. Overnight in the Casa Andina Private Collection Arequipa. Breakfast. Morning transfer to the airport for the flight to your next destination.